Back in 2011, I had open heart surgery, which was kind of an emergency, so I ended up in the hospital a little over a week before the Northwest Permaculture Convergence being held near Portland, Oregon. I was so determined to go to the convergence, that just a few days after I was released we headed down there to the fair grounds near St. Helens, and managed to take part in various workshops and lead a little singing here and there. The one I remember best was the workshop on “Placemaking” led by an eloquent young man named Michael Cook from Portland’s City Repair project. Begun by Mark Lakeman, this project, as I understand it, is an attempt to reclaim neighborhoods as places where connection and sharing of ideas and skills and helpful service and garden produce and play and celebration and grief can happen because of the willingness and longing in people to live in a deeply nourishing way together. 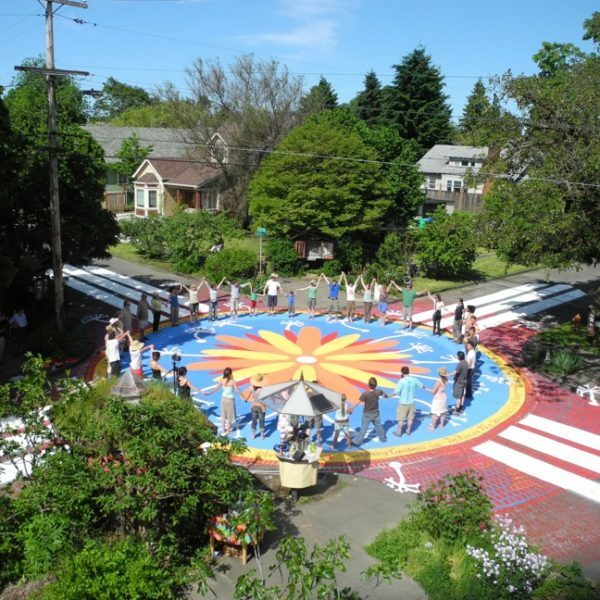 The folks in a neighborhood begin by creating spaces for sharing tea, books, conversation, making cob benches and book sharing kiosks, and even painting a whole intersection with a colorful mandala, where dances and celebrations are held. The phrase that moved me most in that workshop was, “A place is a space invested with meaning.” It was spoken right at a moment when I needed to head for the restroom, so I slipped away with that phrase in my head, and when I reached that resonant concrete fairgrounds facility, this song started up. Upon my return to the workshop, I invited everyone to invest some meaning into our space by singing this song together. It seemed to work. Since then, I have considered the difference between a meaningful and meaningless gesture, event, place, experience, etc. I’ve decided that what makes something meaningless is that nothing nourishing, inspiring, enlivening, or life enhancing actually happens. I feel empty, unmoved, uninspired, disconnected. Conversely a meaningful experience gives me a sense of greater connection and aliveness. I’m moved, inspired, truly nourished in body and soul. So often, that’s what happens when we sing together. We invest our space, wherever it is, with meaning. A place is a space invested with meaning. We can make any space into a place of meaning. It’s a place of connection. It’s a place that’s alive. It’s a place where each soul is seen and all our relations are encouraged to thrive. It’s a place of celebration that holds both our joy and our grief. It’s a place that knows how conflict may be carefully guided to peace. It’s a place were conflict, with truth and understanding, may be carefully guided to peace.